1952 DeSoto Firedome in San Diego, CA for sale. 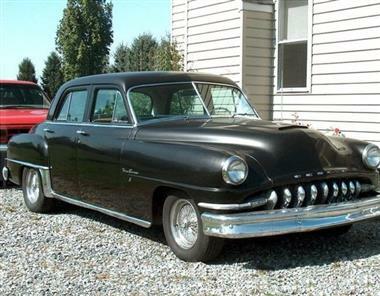 1952 Desoto Firedome Sedan. Runs Fine, original HEMI V8, 276 ci, Fluid Drive Transmission (rebuilt). 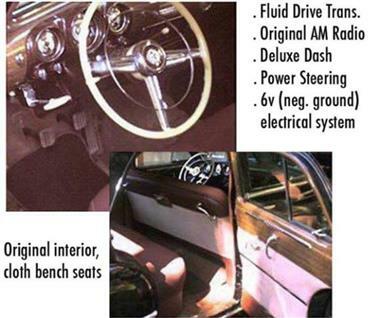 Original Radio, Deluxe Dash / Original Ivory color Steering Wheel (some wear) Car has 62.883 original miles SUPER SOLID. The tires are almost new B.F. Goodrich T/A’s. Custom work: nosed, decked, euro-black paint, dual glasspack mufflers, Keystone wire wheels. Car stored in dry barn each year and driven to local car shows in Pennsylvania in summer. Has little exterior rust (some small bubbles). Had minor body work done and painted down south where it spent a good portion of its life. Interior Original with no tears in head liner, but seats have some tear holes. Front floor pan (drivers side) has some rust.